I am obsessive about washing my my hands. Not obsessive compulsive – I only wash them when there’s a remote chance that some type of mild contamination may be on them – but obsessive nonetheless. In the spring of this year, when the swine flu craze was just hitting America, President Obama went on television and instructed everyone to be careful. “Keep your hands washed, cover your mouth when you cough, stay home from work if you’re sick, and keep your children home from school if they’re sick,” he said. Such simple instructions. Cough into your sleeve instead of your hands. Like when President Carter asked Americans to adjust their thermostats a few degrees to save energy, asking hundreds of millions of people to sacrifice just a little bit can have an enormous effect. Even if only ten percent of the people do it, that’s 31 million people taking action against the problem. The results have been stunning. In the United States, as of September 3rd, the CDC reports there have been only 9,079 reported cases of the swine flu and just 593 deaths. Maybe you think I’m being sarcastic by saying it’s great that only 593 people have died from swine flu in America, but I’m not. Those numbers are fantastic. Less than six hundred people is about 0.0001912% of the American population. About one one-thousandth of one percent is hardly a pandemic or epidemic. It’s fewer than two people per million. It’s practically nobody. For a populace already as unhealthy and susceptible to illness as the American one is, this rate of infection is seriously nothing. Do you know what will kill more people in America this year than the swine flu? Bicycles. Those monsters are more dangerous than airplanes. 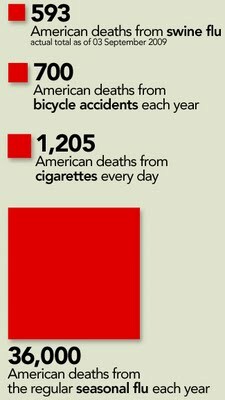 Bicycles kill more than 700 Americans every year according to the Department of Transportation. Airplanes claim an annual average of only 200 of us. You’ve heard it before, but airplanes are one of the safest forms of transportation in existence. Planes are safer than cars, elevators, horses and, yes, they’re even safer than your own two feet. More people die in walking accidents each year than in airplanes. At any given moment there are roughly 5,000 planes in the skies above the United States, according to the National Air Traffic Controllers Association. In 2001, aside from September 11th, out of over 32 million flights that year, only one commercial airliner went down. If you include September 11th in the numbers – crashes that were not the fault of the planes themselves, of course – bicycles still took more American lives than airplanes did that year. During just the week of 9/11, three times more people died in cars than airplanes. 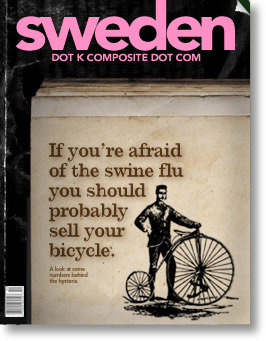 What is ultimately more nefarious than the swine flu, bicycles and airplanes combined is the “regular” seasonal flu. The ordinary flu typically infects up to 20% of the American population each year and kills 36,000 people. Between January 1 and April 18 of this year, more than 800 people died of the regular flu each week in the US. Between midnight and noon yesterday, more Americans died from smoking cigarettes than the number who have ever died from the swine flu. 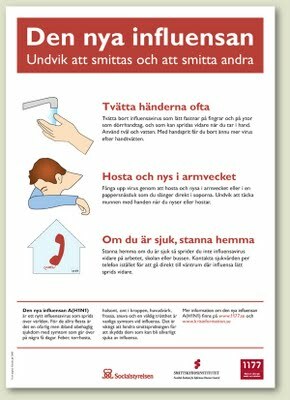 Despite these microscopic numbers and the fact that Sweden just reported its first death from the A(H1N1) virus last week, the gears were set in motion months ago to vaccinate nearly the entire Swedish population. At a cost of around $142 million, the country is buying 18 million doses of the vaccine from GlaxoSmithKline and planning to administer them to the vast majority of the 9.2 million people in the country. This benefit, being provided at a cost to the government of more than $15 per person, will be rolled out beginning this month and concluding in about a year. Doing the same in the United States would carry a price tag of $4.65 billion. It would be so much more expensive in America, you see, because there are more Americans than there are Swedes. You can thank me for that tidbit later. There are actually six times more people in America without health insurance than there are total people in Sweden. If you’re genuinely afraid of the swine flu, here’s my best advice: play the lottery. It is over 1,000 times more likely that any given person would win their state lottery jackpot than get the swine flu. Your odds of dying from the swine flu are so small that if you’re honestly still scared of it, the only thing I could possibly do to calm your fears is to just go ahead and kill you. why bike when you can drive? Such great writing and clever way of thinking, plenty of humor. Congrats and Thank You!!! Thank you so much for voicing my very own thoughts! Swine flue is no worse than regular flu, yet just because it’s “new” and unknown, everyone is freaking out. Silly people…. relax, keep your Vit C levels up, and you’ll be fine. Grab a movie and some popcorn too, while you’re at it.